The story of Daniel and the lions den begins after Nebuchadnezzar king of Babylon made war with Jehoiakim king of Judah. After he won the war he had Ashpenaz, the master of his eunuchs, take certain children, including the king's children, back to Babylon. 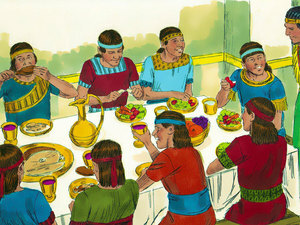 These children were educated and wise, and Daniel was one of them. became king, after conquering Babylon when Belshazzar was king. Click here for the printable Bible Word Search 'Daniel and the Lion's Den'. 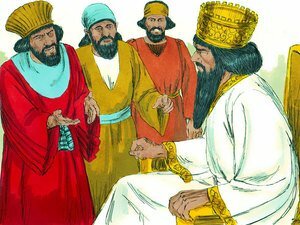 At the time of the story of Daniel and the lions den, king Darius had made Daniel the main president over three elected presidents to supervise one hundred and twenty (120) princes elected to rule over Babylon. petition of any God or man for thirty days, save of thee, O king, he shall be cast into the den of lions. signet of his lords; that the purpose might not be changed concerning Daniel. 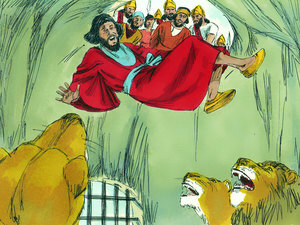 Does the story of Daniel and the lions den inspire you to trust in God?